Yes, SOME OF President Trump’s tweets are somewhat annoying and certainly, as the news media on both sides have pointed out, they are, at least at times, interfering with his own objective: to address the American people directly. I emphasize “SOME” of his tweets because, obviously, in this booming age of social media, tweets are an excellent way to deliver his thoughts and his appeals directly to the American people. The annoying part is when he gets into a social media war with members of the extreme Left-Wing of the American Press, e.g., “Morning Joe” Scarborough and his wife and broadcast partner Mika Brzezinski. Why Fox News? Not because they are more Conservative than the others but because they deal in real journalism. They report the facts, even when the facts do not favor President Trump, and they criticize his tweets on a daily basis, not because he is tweeting, because the Fox News management feels (as we all do) that some of his tweets need criticism. Forget the media for a moment and analyze the situation. We have a president who is highly intelligent, an extremely savvy negotiator and who has proven to be an excellent communicator; but yet SOME of his daily communication to the American people, through Twitter, appears to be mean, controversial and otherwise inappropriate. The answer to this riddle is obvious: Donald Trump not only dislikes it when someone insults him or lies about him (as the Left-Wing media does on a daily basis), he refuses to tolerate it. As Melania Trump has publically stated: “He’s a great leader, he’s fair, (but) as you may know by now, when you attack him, he will punch back 10 times harder.” Does this make him a bad president? I say no! I say it makes him a strong president who will once again (since before President Obama was elected) cause America to be feared by some and respected by all. I seriously doubt that Donald Trump in his heart supports all “Conservative” positions but he’s a man stuck in a political situation and if he wants to get ANYTHING done in Washington, he has to play the Washington game. Disgusting, I know, but that can also be said of politics in general. That’s not really news, it’s been going on since the day after Donald Trump became the presumptive Republican nominee. Politicians are arrogant by their very nature and this is Conservative arrogance at its most potent! Paul Ryan and the GOP elite are essentially telling America’s Republican Primary voters that they voted for the wrong man, that they wasted their vote. These “never Trumpers” certainly have a right to personally dislike the man who will be leading THEIR PARTY through the election cycle after the Convention, but one would think that responsible elected Republican leaders would at least appear to rally around the people’s choice for the nomination, for the sake of the party if for no other reason. One would think that! But when the Speaker of The House Of Representatives goes on television and announces his personal opposition to Donald Trump and essentially tells the millions of people who voted for him that they have it all wrong, he’s committing a form of political treason by giving the presumptive Democratic nominee an advantage over his own party’s nominee. If Rep.Paul Ryan continues making public pronouncements like this last one, one can only hope that the Republican voters in his home state of Wisconsin will remember his arrogant words and actions when he’s running for reelection. Personally, I can see no path to victory for Hillary Clinton in November . . . but then I also bet against Obama’s second term. I was blind to how it could possibly happen. I guess I need to retake the ‘Prophet 101’ home-study course. The Times story was basically the same one dominating the news cycle this weekend, about that epic (excuse me, I mean “epochal”) split in the GOP that is threatening and terrifying those who choose to call themselves Conservatives. A term that I love, used either by or about Donald Trump’s approach to politics is Commonsense Conservatism”, I saw that and said “Voila” (figuratively of course); that’s what was missing in Conservatism, common sense. I always use to hesitate to identify myself as a Conservative because most Conservatives are still piddling around with the “religious” Conservatism that was born in the 1960s and was ingrained by the 1980s. Religious Conservatism is in itself an oxymoron that was created to convince legislators that they have the right to interfere with social issues that have no reasonable link to the Constitution or to the major functions of the federal government. Even outside of the ‘Religious Conservative’ context, the GOP has been making a fool of itself for the past 4 years by being unwilling or unable to keep the promises made to voters in 2012. These are the same voters who believed the promises and put Republicans in majority roles in the House and Senate with the understanding that, among other things, they will replace ObamaCare with something that gives the power over healthcare back to the people. That didn’t happen, in spite of the supposed “power of the purse” held by the majority of Republicans in the House. Not much else has been accomplished either to undo the damage that Obama, and his cadre of Liberal followers has done to the country and the Constitution. 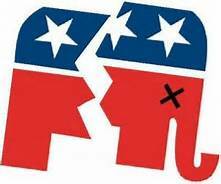 Considering all this, a “split” in the GOP is almost inevitable unless the powers that be start getting in touch with and in tune with the commonsense Republican ideas that caused a majority of primary voters to flock to Donald Trump. 1) The ‘small, unobtrusive government’ leg to allow citizens to be truly free from unwanted, unneeded political influences in their lives. 2) The ‘strong national defense’ leg to keep citizens safe from enemies who either envy or hate us for being free and strong. 3) The ‘free enterprise’ leg to maintain the American traditions of invention and industry that create an atmosphere amenable to personal wealth building and charitable giving. To maintain order, this stool sits on a platform of laws that are devised to protect citizens from the greed, jealousy and arrogance that lives within all of us . . . and controls some of us.. The “American Stool” I have attempted to describe above represents a basic Libertarian vision of America; a vision of free men and woman making their own decisions and acting on them with the only restriction being respect for the property and privacy of others. America grew from a fledgling nation to a world power based on the three principles that support that Libertarian vision. Some will try to make you believe that the ideals of small government, a strong national defense and free enterprise are Conservative ideals, that’s not quite true! If you trade in your ‘Libertarian stool’ for a ‘Conservative stool’, you are likely to get a stool with the same three strong legs, but also a fourth leg that does not quite reach the ground: the Judeo-Christian leg. Greed, jealousy and arrogance unleashed, in the hands of those who set aside America’s Constitution and tried to replace it with a Christian Bible began the destruction of the American political system in the late 1970s, when an unsubstantial fourth leg was added to the American Stool; the Judeo-Christian leg (aka the Moral Majority leg). This leg was weaker than the other three legs because it was fashioned out of ephemeral hope and wishes and fueled by a greed for power as well as the arrogance of organized religion, i.e., spiritual desires are served rather than human needs. In the wake of the Supreme Court’s Roe v. Wade decision the self-important Christian Right jumped on the decision and eventually, successfully managed to corrupt the Constitution’s clearly implied desire to keep religion and government separate; they did this by inserting Christian ethics into, what was intended by the founders, to be a system insulated from and superior to religious belief. Remember that first leg of the American stool, the ‘small, unobtrusive government’ leg, intended to allow citizens to be truly free from unwanted, unneeded political influences in their lives? Thanks to the corruption of the American political system caused by the Christian Conservative faction in the government, that leg has deteriorated to the point where, among other things: the logical right of a woman to control or terminate her own pregnancy is being challenged by politicians instead of by pediatricians; and where government officials attempted, and almost succeeded, to preempt the right of two adults to get married unless the match was approved by the state. It needs to be made perfectly clear to politicians and government agencies that an American with strong religious beliefs is NOT ‘superior’ in any way to an American who does not share those beliefs. We are a nation of laws, not moral edicts. I do not in any way claim that a set of personal religious beliefs is a bad thing, but Christian Evangelists need to be reminded: that we are a nation of laws that have ascended from centuries of tradition and experience; Christian ethics that harm or diminish personal freedoms and rights must be condemned. What the Republican Party needs, if it hopes to defeat the ‘Illogical Left’ in 2016 is a candidate who values (and espouses) a rational plan to return the United States to its positions of economic and military leadership in a world that appears to be lost and uncertain in the wake of a weak and floundering central government. A Democratic victory in the U.S. Presidential Election in November of 2016 would be disastrous to the United States, to the few countries we can still count on as allies and to the world’s economy. I firmly believe that what the Republican Party, The United States and ultimately the world needs is a safe and strong United States that stands un-intimidated in the face of dictators and in the face of the rabble who are attempting to destroy all the underpinnings of a civilized world in the name of the most brutal aspects of their religion. Anything less than a return to sanity in Washington, on ‘Main Street’ and on Wall Street and the rebuilding of a strong American military that reflects the traditional values of the United States will not be enough to save us from the uncertain future we face today. Soft-spoken, intelligent Ben Carson is certainly capable of learning what he needs to know to run the country, but, relatively speaking, if elected, he would be like a first-year medical student doing brain surgery. Donald Trump is undoubtedly a very successful entrepreneur who, as president, would most likely be able to understand and control our currently out of control economy, but it appears that, as our ‘really great president’, the United States Constitution would rapidly be replaced by a still unwritten tome titled ‘The World According To Donald Trump’; the problem is, that isn’t the way the world or the United States works. So who is this leader that can restore America to greatness? My hopes are on Ted Cruz. Originally, in this blog, I boosted Donald Trump and then Ben Carson. They are both good men who share my vision of a safe, strong, powerful United States. Why then this shift to Ted Cruz? Ted Cruz also shares my visions for America and, as a sitting United States Senator (TX) he has proven to oppose the business-as-usual, just-for-profit, anything to get reelected mentality of many (most?) members of Congress. Also, as a sitting member of Congress, he has valuable insights into how our government works now and, more importantly, what can be done to make it work better for the American citizen/taxpayer. This “insider” advantage, combined with his commonsense, anti-establishment, ‘politically incorrect’ positions on the important topics of National Defense, the economy and public welfare makes him preferable to Ben Carson or Donald Trump. NOTE: Ted Cruz is currently also being touted as the ‘flavor-of-the-month’ for Evangelical voters. As long as his religious beliefs have a negligible effect on his important positions and he continues to quote from the Constitution and not from some religious text, I’m alright with that. All about Ted Cruz : Follow the links for his Bio, his philosophy, his positions and more. W.P. Wonk Blog: The Washington Post publishes the “Wonk Blog” on a regular basis, a current post on that blog is “A guide to what Ted Cruz really believes” . While the Washington Post is not a big fan of Ted Cruz (or any Republican) their ‘Guide to Ted Cruz’ is an interesting and apparently fair look at Ted Cruz’ positions relative to Donald Trump and other Republicans.